In 2 Corinthians 13:5, the apostle Paul asks the Corinthian believers a question: ‘Or do you not realise about yourselves that Jesus Christ is in you?‘ We might find this phrase, ‘Jesus Christ is in you’ surprising, or perhaps we just read over it without thinking too much about its significance. But what does this phrase mean? And what is its importance for our Christian lives today? In saying, ‘Jesus Christ is in you’, Paul was not speaking poetically or metaphorically. He truly meant that Jesus Christ is literally, practically dwelling within the believers. Many other verses in the Word of God confirm the fact that the Lord Jesus Christ actually dwells in His believers. We too, like the Corinthians, need to realise this fact about ourselves. Christ is not merely outside of us, a Helper in our time of need, but He dwells in us, living in and with us all the time. Christ is the holy God incarnated as a man, and we are fallen sinners. So how can Christ live in us? To accomplish His desire to dwell within mankind, God took some tremendous steps. First, God Himself became a man named Jesus Christ. This man, Jesus, lived a genuine human life on this earth, yet without sin. In His living, His actions and His speaking, He fully expressed God. After living and experiencing everything of human life for thirty-three and a half years, Jesus died on the cross for our sins. Through His redemptive death, we can be forgiven of our sins and brought back to God. But this is not all. After three days He rose in victory from the dead, and in resurrection, He became the life-giving Spirit. As the Spirit, He is available to everyone and will enter anyone who believes into Him. Thus, when we pray to receive the Lord Jesus, God actually comes to live within us today. The apostle Paul describes the believers as earthen vessels that contain ‘this treasure.’ What is this treasure? It is Jesus Christ, in whose face we see the glory of God. Christ lives in us earthen vessels as a precious treasure, revealing to us the glory of God from within. We might think this verse should read, ‘It pleased God…to reveal His Son to me.’ But in the original language of the New Testament, Greek, the verse reads ‘to reveal His Son in me.’ God’s plan is to reveal His Son in us, from within, rather than to us, from without. Or, to put it another way, God reveals Christ to us from within us. To those who have Christ in us, God is pleased to reveal in us more of the wonderful Person of Christ. Here, Paul did not say ‘I live in a Christ-like way’ or ‘I glorify Christ through my behaviour.’ No, he said, ‘Christ…lives in me’, clearly telling us that Christ lives in His believers. The Christian life is not a matter of behaving like Christ, but of allowing Christ Himself to live in and through us. Paul viewed the believers in Galatia as his spiritual children. He had laboured to help them receive Christ at their salvation, and in this verse, he continues to labour on them so that the Christ they received would be fully formed in them. Christ lives in us from the time we are saved, but He wants to be formed in us in a definite way. Day by day, we need to give Him the opportunity to be formed in us. As we do, Christ will be able to express Himself more fully through us in our daily life. Christ’s second coming will surely be a marvel. But according to this verse, the most marvellous thing will not be the outward display of His coming; it will be His glory revealed from within His believers. The Christ in us, who lives in us and is being formed in us, will be revealed from within us, and even our bodies will be transformed to match Him. 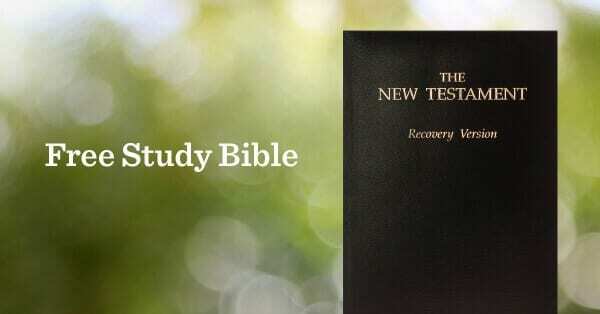 We encourage you to get into these eight verses, and others like them, with the help of the notes and cross-references in the New Testament Recovery Version. God’s Word can give us a proper and solid understanding of this precious truth, that Christ lives in us, and help us to realise about ourselves, just as Paul exhorted the Corinthians, that Christ is indeed in us. Such a realisation will enrich our experience and enjoyment of Christ in a practical, daily way.